Ukrainian President Viktor Yanukovych and opposition leaders have signed a deal leading to an early presidential poll before the end of the year. The election is part of an agreement to end the country’s political crisis. The deal provides for a national unity government, electoral reform and constitutional changes reducing the president’s power. The compromise came after hours of talks, mediated by three European Union foreign ministers. The German and Polish ministers met protest leaders, who later announced that they backed the deal. A deal to end the crisis in Ukraine has taken a major step forward after protesters agreed to a compromise by the president to form a coalition government. Opposition leader Oleh Tyahnybok said a council representing protesters in Independence Square backed the deal on condition that the current interior minister and prosecutor-general are excluded from any interim government. The protesters’ refusal to agree had formed a major obstacle in getting the deal signed. The three opposition leaders – Mr Tyahnybok, Vitali Klitschko and Arseniy Yatsenyuk – met with President Viktor Yanukovych at the presidential HQ in Kiev to sign the deal. In a statement on his website, Mr Yanukovych announced presidential elections would take place this year and promised to form a coalition government. The elections had been due to take place in March 2015. He also promised to revert to the country’s 2004 constitution which will trim presidential powers – one of the key demands of protesters. The EU has agreed to impose sanctions on Ukrainian officials “responsible for violence and excessive force” after the bloodiest day of clashes in Kiev. In a statement, EU foreign ministers said targeted sanctions including asset freezes and visa bans would be introduced “as a matter of urgency”. 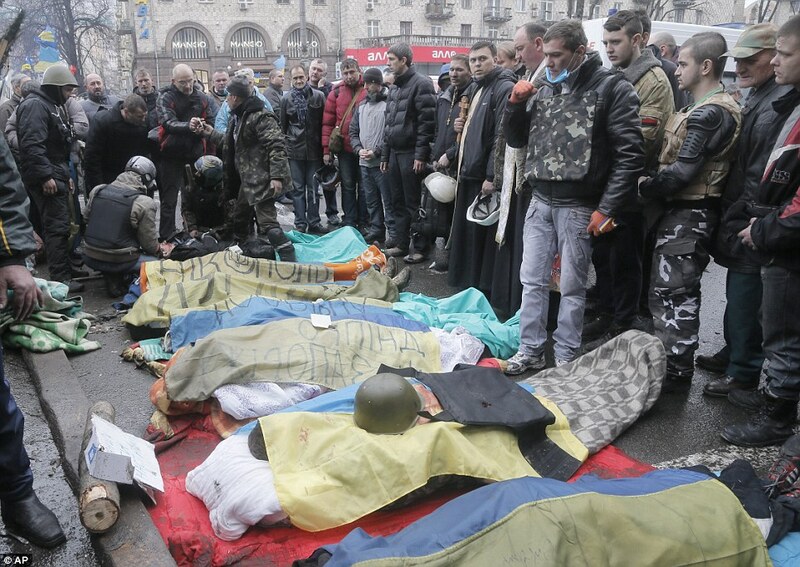 Dozens of anti-government protesters died in Kiev on Thursday. Many were reportedly killed by snipers. In all, 75 people – including policemen – have been killed since Tuesday. In addition to those, Ukraine’s health ministry also said that 571 were injured during three days of violence in the Ukrainian capital. Protesters had captured 67 police, the interior ministry said. A number of them were later released by activists on the main protest camp in Independence Square – widely known as the Maidan. The tense stand-off is continuing overnight, with the activists standing guard on the Maidan barricades for possible new police attacks. For a moment, the white blanket serving as a shroud fell back, revealing the dead man’s frozen face and a crimson bullet wound on the left side of his head. A single round penetrating above the ear had killed this Ukrainian protester, who looked to be in his 20s. His corpse lay beside those of six of his comrades under the awning of a café in the heart of Kiev on Thursday. “It was a sniper,” said Dr Vasyl Lukach as he stood beside the bodies, placed carefully in two rows. “They all have one or two bullets each in the head or in the neck. It was a professional.” Like many other medical personnel, Dr Lukach has volunteered to care for the protesters massed in Independence Square. As he spoke, an eighth corpse arrived on a green stretcher, followed closely by a ninth. Both were shrouded in blankets, but as the last body was laid down, the cover slipped to reveal another pale face with mouth agape — and the matted blood of a telltale head wound. The huddle of doctors and protesters at this makeshift morgue on the pavement of a European capital needed no further proof. “Sniper” was the word they whispered. As if to emphasise their point, a volley of shots rang across Independence Square. Minutes later, a 10th body arrived to the echo of sporadic gunfire. This time, the dead man was fully shrouded and his face invisible, but the white cloth over his head was bloodstained. Violence exploded on the streets of Kiev again yesterday as clashes between riot police and protesters plumbed new depths of savagery. The bodies of 20 civilians lay strewn on the ground after riot police were authorised to use live ammunition in place of rubber bullets. There were reports of snipers firing at protesters. And, in a chilling twist, the demonstrators took at least 67 police officers hostage, according to Ukraine’s interior ministry. As many as 70 are believed to have died and up to 500 injured – on what was supposed to be a day of mourning for those killed earlier this week. Protesters hurled petrol bombs and paving slabs at police in a three-hour battle to recapture Independence Square, where former hotels have become makeshift mortuaries. Just hours earlier President Viktor Yanukovych had agreed a truce with opposition leaders ‘with the aim of ending bloodshed’. But after the Ukrainian leader met an EU delegation of German, Polish and French foreign ministers to discuss a ‘road map’ to peace, demonstrators held police captive in Kiev’s occupied city hall. At least 70 anti-government protesters have reportedly been killed after police fired live rounds near Independence Square in Ukraine’s capital Kiev. The claim was made by a doctor working with the activists, who said more than 500 demonstrators had been injured and warned the death toll could rise further. Meanwhile, the interior ministry said protesters had taken 67 police officers hostage, thought to be in the occupied city hall. Hotel lobbies have been turned into makeshift hospitals, where some of the injured activists were given emergency treatment. It was the deadliest day of clashes in three months of protests in the capital. Government snipers apparently fired at demonstrators after petrol bombs were hurled at police lines. Armed protesters then returned gunfire. The interior ministry said authorities had repeatedly warned activists they were breaking the law. Residents have been told by police not to go outside, and Kiev’s mayor has resigned from the ruling party in protest over the bloodshed. The city’s health department said 67 people had been killed since Tuesday. EU foreign ministers meeting in Brussels agreed to impose sanctions on officials held responsible for the violence, including a travel ban and asset freeze on close allies of Ukraine’s president Viktor Yanukovych. He has been discussing a possible “roadmap” with German, French and Polish foreign ministers to try to end the crisis and was willing to hold early elections this year, according to reports.